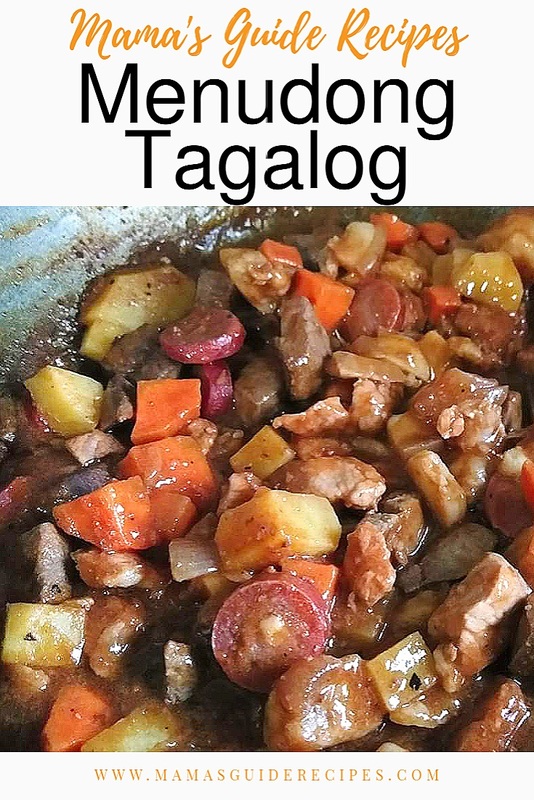 This is how real Menudong Tagalog is cooked. Back in the days, when ready made pouches of tomatoes are not yet common. This is how Menudo is cooked, no instant tomato sauce and no instant tomato paste. Just real tomatoes, all natural ingredients. Happy cooking! In a large bowl, marinade pork into vinegar, soy sauce, salt and pepper, garlic and onion for about 30 minutes or longer. Meanwhile, heat oil in a pan and you can fry the potatoes and carrots (half cook). Remove from pan and transfer into a plate. In the same pan, saute garlic, onion and tomatoes then add the marinated pork. Don’t mix, just pour in the the marinated pork into pan for 15 mins without mixing. Then mix it to cook evenly, add liver, sausages or hotdogs, then add the half cooked potatoes and carrots. Let it simmer for about 10 minutes. Add the liver spread, salt and pepper to taste. Finaly, add the sliced red bell pepper, let it simmer again for another 5 mins. Turn off heat.